This is a great item to pass out to others. We received 10 today and have only three left. In fact I ordered 10 more. 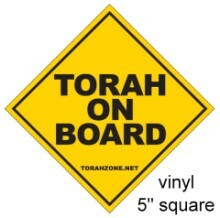 I have had this sticker on my back window of my truck for 5 years, 2 weeks ago my truck was totaled. Now I am in process of getting another truck and will fly this sticker. Shalom! !